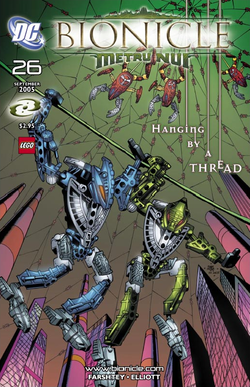 Hanging by a Thread is the twenty-sixth issue of the long running BIONICLE Comic series, and the fifth issue of the Hordika saga. It is preceded by BIONICLE 25: Birth of the Rahaga and is followed by BIONICLE 27: Fractures. Facts about "BIONICLE 26: Hanging by a Thread"